Great analogy — this is a helpful framework in which to plan social media strategy and tactics. Love this. As a dietitian by trade we love to see things in pyramids lol. One caution is for Yammer, which some companies are finding privacy issues with company sensitive materials. Love what you are doing with the Sharing Mayo blog. How fun Lee! A chance to share an artist rendering of your Social Media Pyramid. My mother, the dietitian, is appreciating your comparison. The opportunites are endless for sharing ideas with Mayo Clinic. Great job! I love the idea of simplifying this and there is certainly benefit in offering suggestions for number of servings. In almost every column you mention something to the effect of “if you have something to say,” in other words… if you have real content. My experience has been that there are twitter users I’d like to hear from 20 times a day, while some should not be tweeting at all… but all of that is relative to what is important in my life. However, I think twitter alone cannot be the foundation of your pyramid. For twitter to become strong enough to hold up the rest of the pyramid you need to have a hub for relationship building content. Whether that’s a facebook page or a blog (depending on audience and objective) I think it has to work hand in hand with twitter, much like fruits and vegetables exist on the same level in the USDA pyramid. Again, all of this is relative depending on what you’re trying to do with social media… all my wife wants is to connect with her long lost high school friends on facebook; so for her, all of my strategy is really annoying. Thanks to all of you for your comments. Ryan, I agree that Twitter shouldn’t be the foundation of a fully developed social media strategy, but I’m seeing this as more a progression than a physical structure. Going back to the Maslow analogy, I would say you can’t reach your social media peak performance without a blog to tie it all together. So whether the blog is the foundation or the peak, I agree that’s essential and should be the hub. I’ve got another post on this today, and have another in mind relating to the “if you have something to say” point you made. I think you need to add passing notes during class (k-12) to the foundation of the social media pyramid. Is that where, when, and how social worlds emerge via media? And I’m actually not kidding! Lee, I appreciate the depiction of your hierarchy of social media needs. It prompts a worthwhile dialogue here that mirrors one that’s happening in every networked business on a daily basis: How do I rank the relevance of the various social media platforms? I have to say, however, that from my perspective, none of what you describe constitutes strategy. It comes across like a hardware salesperson from the Snap-On Tool Company laying out tools, and telling us what tools are most important…WITHOUT KNOWING WHAT THE TOOLS WILL BE USED FOR! If, for example you’ve got a vault of video related to your subject, or if there’s some incredibly emotional and compelling content available on video, then You Tube (or Vimeo or Hulu or Veoh– each has its own strengths, and merits its own ranking-within-ranking) can become the foundational platform, and the other platforms will be implemented to drive awareness and patronage. As a couple of the commentors above have mentioned, the configuration of networks is not predicated on the technology, it’s based on narrative. Before I can tell you what tools you should be using, tell me what you’re going to use them for. Then we’ll talk. I have a friend, Dr. Greg Gramelspacher, who will be biking across the U.S. in September/October to draw attention to the plight of the dying poor in America. It is his life’s work. Through the Palliative Care Unit at Wishard Hospital in Indianapolis, Dr. Greg has personally cared for over 3,000 people dying poor and homeless over the past 20 years, and his ride is a commemoration of those lives. At the heart of his ride is the idea that every human life is worth remembering, and everyone deserves to die with dignity. I’m helping him with his social media strategy. The foundation of the platform will be, literally, a foundation site, where people can donate to his cause. The rest of the strategy will radiate from there (twitter, facebook, blog), informed and supported by his narrative, and stories of people who have died, but should not be forgotten. Really great points, and I will be doing a follow-up post on this. 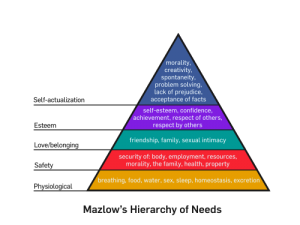 The point of the Pyramid (no pun intended) isn’t to rank these in importance, but to put them in some perspective…and to let people know that they wouldn’t need to be on every video sharing site, for instance. As you say, there may be reasons to pick sites other than Facebook or YouTube within the video or social-networking categories. Anyway, I really appreciate your comments, and if you’d be interested in becoming an associate professor at SMUG and doing a post or two, you’d be most welcome. Previous Previous post: Join the Revolution!